Lost Garden: Realm of the Mad God Released! Great write-up and sounds like an interesting game, I may have to give it a spin. I wonder whether the level system itself was ever questioned? I have a design for an "indie MMO" of my own in my pocket, in which I feel I developed a replacement for the level system. The WoW designers I talked to during my time at Blizzard always regarded the level system, and the barrier it creates between friends playing together, as the game's greatest weakness. It seems pretty rooted in the formula, but I'm interested in challenging that assumption. No upfront price. You can play the entire game for free with all the classes and never pay a cent. The game makes money by selling dyes, pets and the occasional temporary boost or potion. These are mostly for players who want to feel powerful for a while, you certainly don't need them. We questioned the level system a lot. 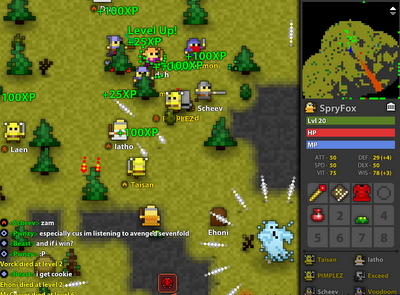 It is still in place, but only takes about 30 minutes for an experienced play to go from level 1 to the max level cap of level 20. There is a small group that likes to grind for rare stat-boosting potions. Also, we don't restrict who you can play with. So you often see low level players hanging out with more experienced players. Nice; if you can't eliminate levels, you can at least change them into a form that doesn't hinder cooperative play. I'll be honest that I'm a little disappointed that it's not pay-to-play on the App Store; I was hoping I was seeing a new indie game that would buck the trend of "all Flash games are free." I've been hoping that the Chrome Web Store would represent a realistic way for some excellent Flash-based game to become a breakout hit even though it has an up-front price (even if it's just $.99). It would be nice if Flash game devs at least had the option of monetizing that way. For now I still haven't seen that kind of paid breakout hit on the Chrome Store... perhaps with time though. Great game, although I started to get a little bored when I couldn't find any hard enemies to fight. I'm also really curious about the backend and how it's set up. Are you able to talk about that, or is there someone else I could talk to to learn more about it. Uhm, Chrome Web Store? Why do you believe it is a good idea to only give Chrome users the ability to play your game? They have a market share of just around 10% as far as I know. If you are have difficulties with Chrome Web Store, give the url http://realmofthemadgod.com a try and it should all work. Interesting game, definitely doing many things right. The MMO and co-op aspects are really nice. I am very impressed with the tech. 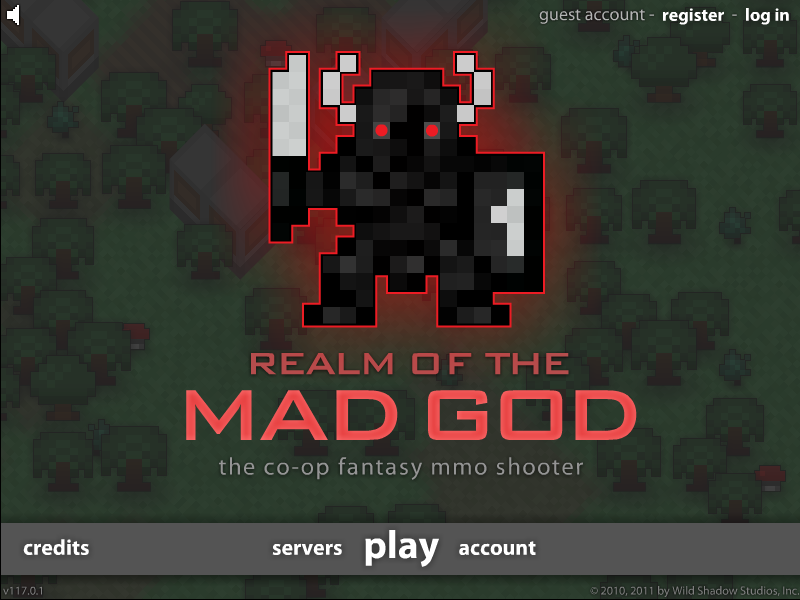 So many players, enemies and bullets running real time in Flash in amazing. I am in awe I could keep my guest account after I signed up. However, it could use some work as a shooter. Too often I am being shot offscreen by enemies I cannot see, their bullets move too fast to truly react to most of the time. The enemies are too random (or just rush you) to discern and adapt to a pattern. Combat comes down to the standard "beat on each other and manage potions" rather than the skills associated with a shooter. There is also no shot mechanics past "shoot and smartbomb". Unusual mechanics such as polarity (Ikaruga), mosquito (mars Matrix) or grazing (DoDonPachi) is what makes these kinds of shooters outstanding. A bit of deeper design around the shooting would help bring in the shooter fans. Great reviewlet on Rock Paper Shotgun. Hopefully brings you lots of customers. I played it after RPS coverage, and loved it. Such tight design and brave decisions (permadeath, insta-teleport, bag restrictions, no loot level restrictions). It's just really well honed. And yes, you got my 10 bucks for another character slot and a vault chest, which is great value, and has transformed how I play ('lending' gear from my 20 to my levelling char, using my 20 to get better gear for my levelling char etc). It was only 3 days after I started playing it that I saw that you were involved Danc, and that's when it all made sense. Great design, great execution. I hope that the business model is sustaining you guys. I must admit that this is the first ever "play for free" game that I paid for. I suppose I should have invested my ten bucks into a character and a chest rather than two chests, but ah well. I really like how players work togehter in the game, and the idea that good items are just passed around for free also takes my liking. Certainly, for the top tier items this will not be the case, but that just means there is a motivation in going on after level 20. What kind of hardware is it running on? I have some comments on the co-op. The beat of the game in the battle places are too fast and dangerous, so it is quite difficult to chat with and communicate with other players using the chat box. Therefore, there is a feeling of playing with other (clever?) robots instead of real people.